Home to a thriving arts scene, six craft breweries, and an abundance of bars and pubs serving Texas’ finest brews, San Marcos is the place to be if you love art and craft beer. Better yet, this charming Hill Country town offers numerous ways you can experience both together. Not only will you admire some amazing art, you’ll get to taste some of the best beer in the Lone Star State. See how to do both below, then plan your next visit to San Marcos here. Tie on your walking shoes and check out the works of top local artists, then make the short stroll to a local brewery to savor a pint of oh-so delicious Texas craft beer. If this sounds like the perfect day to you, then you need to head to downtown San Marcos. Browse the artists’ stalls, buy something awesome to take home with you, and get in some free yoga or tai-chi during Art Squared, held every second Saturday of the month from March through December. There’s more art to be seen during the 3rd Thursday Downtown Walkabout, when you can shop local merchants and listen to a concert in a cozy alley that is part of the Kissing Alley Concert Series. Along with being a stage for artists, San Marcos is ground zero for beer lovers. 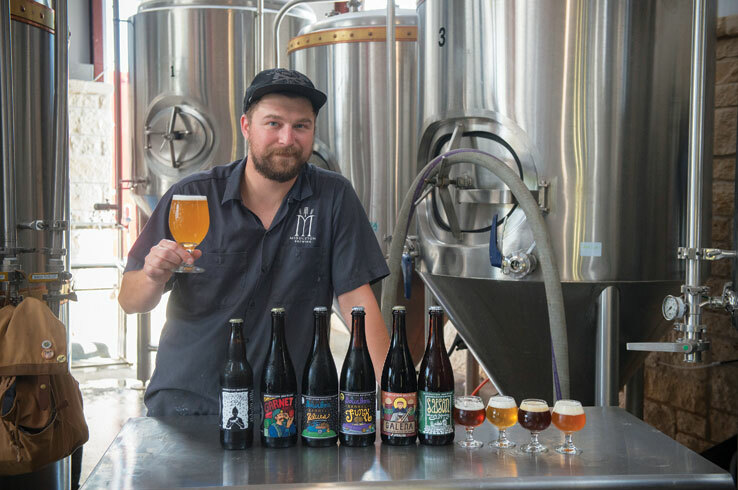 Savor locally made beer at AquaBrew, where you can take your pick from such brews as a hop-forward IPA, a full-bodied Belgian-style tripel, and a porter that tastes of chocolate, coffee, and caramel. Just down the street, Sean Patrick’s Irish Pub & Texas Grub has a staggering 70 beers on tap, including six made in house. Order your beer of choice and enjoy the Irish ambience as you watch the game or play a round of pool. Hops & Grain Brewery, and award-winning brewery based in Austin, will be opening a second location in downtown San Marcos soon. 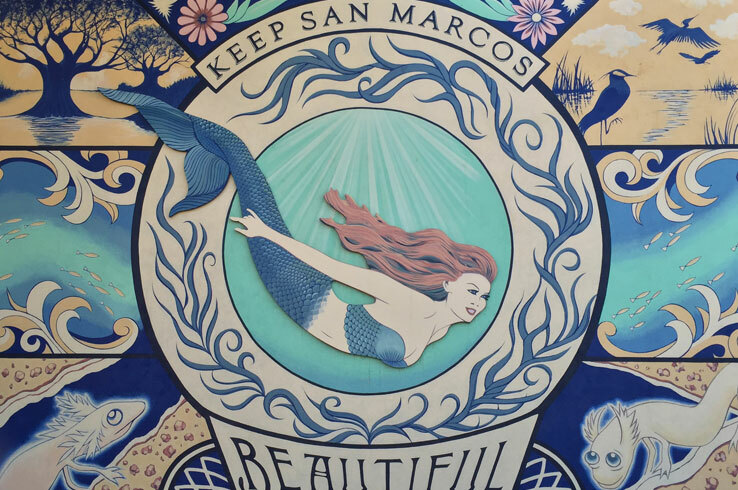 Large and small, whimsical and epic, San Marcos’ many murals create a kaleidoscope of color throughout downtown San Marcos. Embark on a mural scavenger hunt by starting with a beer at Taproom Pub & Grub. Savor your choice of 42 beers on tap, some brewed in Texas, and step outside to see a mini-mural depicting a tiny mouse who is in love with a girl from the “right side of the tracks.” Hoof it through the north side of the downtown area and you’ll come across other fanciful small-scale murals like a squirrel playing a trumpet and a blue heron picking up cigarette butts. When you get thirsty, take a break at The Root Cellar Café & Brewery. Along with a selection of Texas-made brews, The Root Cellar has an array of its own in-house beers with your name on them. Once you’re refreshed, stroll a block south to see Dive Into the Divine, a large mural on the back of The Root Cellar Bakery Building. Continue exploring downtown San Marcos and you’ll come across even more murals, each with its own story to tell. To plan out your scavenger hunt, check out this interactive map of San Marcos. Glass blowing is an age-old artistic tradition that dates to the earliest days of the Roman Empire. The techniques practiced thousands of years ago are still in use today, and you can see expert glass blowers use them at Wimberley Glassworks. Settle in to the 75-seat demo area and watch as the artists craft works from molten glass. 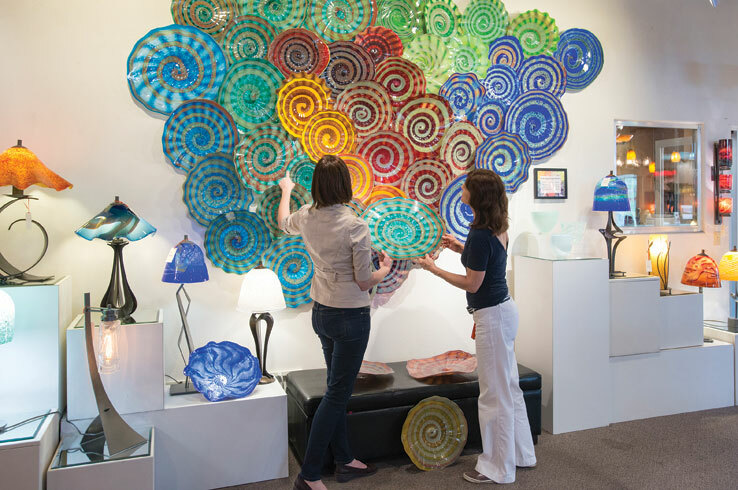 Take a moment to shop the collection of glass platters, mugs, and other items, then browse more wares at Silo Gallery + Studio. Walk out of Silo Gallery + Studio and you won’t have to go far for beer. Head next door to Middleton Brewing, purveyor of pale ales, American reds, barrel-aged brews, and award-winning beers like its robust Black Lab Porter. Sip your beer as you take in the view from the rooftop seating area, or bask in the sunshine on the outdoor patio. With so many kinds of beers brewed in house, you won’t want to leave. The preparation and plating of food is just as much of an art as painting or sculpting, with the end result being far more delicious. Add in a selection of beer chosen to perfectly balance what you’re eating and you’ve got something truly amazing. This palate-pleasing experience is exactly what you’ll get at Middleton Brewing’s Culinary Zymurgy. Held once a month, the event showcases different culinary styles with dishes prepared by local chefs. Dig in as you savor beers chosen to complement each dish of your decadent multi-course meal. Seating for the Culinary Zymurgy is limited, so you’ll want to purchase your tickets as soon as you can. Check Middleton Brewing’s website for more information on upcoming events and to book your spot. 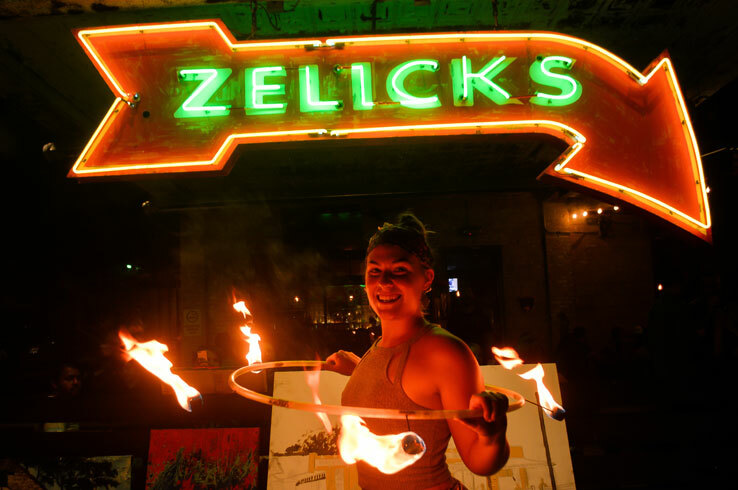 It’s not often you get to watch an artist at work or fire spinners lighting up the night, yet both are all part of the fun at Zelicks Ice House’s monthly Martian Culture. Watch painters create works of art, hoopers, and other performers as you enjoy a beer by Altmeyer & Lewis Brewing Company, San Marcos’ first production brewery. Zelicks Ice House has other Texas brewers on draft, as well as an onsite kitchen that serves up juicy hamburgers and crispy fried chicken sandwiches. Built within a 1930’s gas station, Zelicks has the kind of quirky charm that makes it the perfect place to soak in all the Martian Culture. 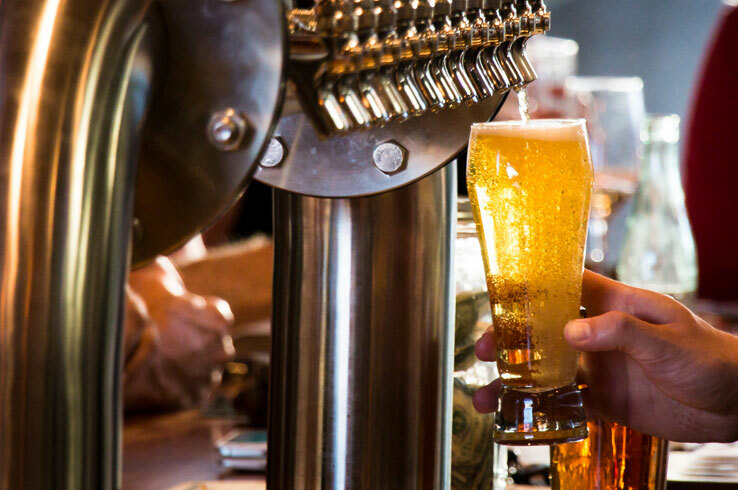 Given its abundance of artists and brewers, San Marcos should top your list if you’re either an art enthusiast or you love a great pint of locally made beer. Plan your visit today.